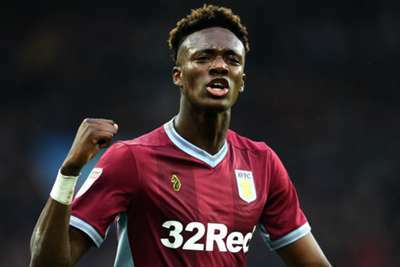 Tammy Abraham is determined to get the chance to play for Chelsea next season after some strong performances for Aston Villa. The 21-year-old striker has scored 21 goals in 32 Championship appearances in 2018-19, helping to lead the club's charge for the play-off places. Chelsea are facing the prospect of being unable to register new players until January 2020, having been issued a one-year transfer ban by FIFA for breaching regulations over the signing of young players, although the club are appealing against the punishment. Abraham could become involved more regularly at Stamford Bridge if they cannot sign any new forwards, and he intends to make the most of any opportunity he is given. "That's the aim going into next season," he told Sky Sports News. "As a young kid, I've always believed I will play for Chelsea. I always believe that. "I think I have the ability to. I just have to, when I get the opportunity, grab it with two hands." Abraham has this week seen England Under-21 team-mate Callum Hudson-Odoi called up to the senior national squad, and he is delighted for the winger. "He was always coming into my house. We didn't really play together because he was a bit too young, but he was my brother's age," said Abraham. "They're good mates. "Watching him grow up to where he is now, he's done very well. He's more than deserved this call-up. I'm very happy for him. "Ever since a young age, he's been unbelievable. Now he's actually doing it in men's football for the world to see. It's heart-warming. I just hope he continues that and carries on building."